This month, Amazon.com offers up to 30% off their already low prices on Gluten Free products. 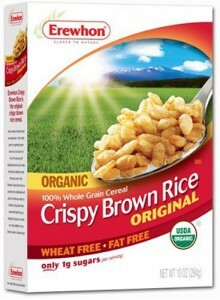 Save an extra 30% on Post cereal sold by Amazon.com. Erewhon Cereal – Large variety of Gluten Free cereals – corn flakes, rice puffs, etc. Highly recommended for those cereal cravings! Save an extra 20% on Erewhon cereal sold by Amazon.com. Save an extra 23% on Barbara’s Bakery cereal sold by Amazon.com. Save an extra 25% on Udi’s granola sold by Amazon.com. KIND Bars – Very delicious snack bars – I recommend the almond & coconut! Save an extra 30% on KIND bars sold by Amazon.com. Save an extra 25% on Pure bars sold by Amazon.com. Save an extra 25% on NuGo bars sold by Amazon.com. Save an extra 30% on thinkThin bars sold by Amazon.com. Oskri Products – Fiber Bars, Museli Bars, and more. Read our review of Oskri bars. Save an extra 30% on Oskri bars sold by Amazon.com. Nature’s Path – Gluten free cereals and more! Save an extra 20% on Nature’s Path products sold by Amazon.com. EnviroKidz – Gluten free cereals, snacks and more! Save an extra 20% on EnviroKidz products sold by Amazon.com. Pamela’s Baking Mixes – One of the “classic” standby mixes, Pamela’s is good to have on hand. Save an extra 25% on Pamela’s baking mixes sold by Amazon.com. Bob’s Red Mill – The king of Gluten Free flours from their Gluten Free facility. An extra 20% off is a pretty hot deal! Save an extra 20% on Bob’s Red Mill products sold by Amazon.com. Pamela’s Cookies – Tasty Gluten Free cookies from a Gluten Free pioneer! Save an extra 25% on Pamela’s cookies & shortbread sold by Amazon.com. They also have special offers on Gluten Free Gift Baskets, which look delicious! Go visit amazon.com now and take advantage of these deals before they sell out!